Elizabeth’s main claim to fame is that she gave birth to one of the greatest American culinarians – James Beard (food writer & critic, cookbook author, culinary educator and authority on food). 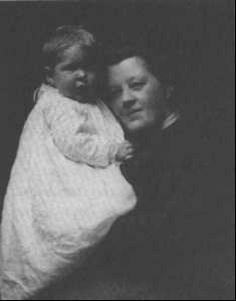 She was born Elizabeth Jones in the countryside of Wiltshire around 1868, and was adopted by a childless aunt and uncle who lived in London. At sixteen she was eager to see the world, jumping at the opportunity to tour the U.S. as a governess for a Canadian family. At the end of two years, they happened to be in Portland, Oregon when the family was suddenly called back to Toronto. Elizabeth decided to remain in Portland, found a job, saved her money and went to live in New York where she made lifelong friends. She moved back to Portland and continued to travel now and then. She was married twice – her first husband died after only a year of marriage, and her second marriage to John Beard (James’ father) was in 1899. According to Beard, she was a great businesswoman, gourmand and connoisseur. She owned and successfully ran a hotel called the “Gladstone” in downtown Portland, overseeing the food served to her guests made by her loyal Chinese chef, Let. She painstakingly made sure that only the freshest, highest quality and seasonal foods were served to her guests, shopping for the best hams, beef and produce.